If you are a fan of macho looks, then a nice looking, trimmed beard might be the most valuable thing for you. It sounds very passionate to walk every day with a nicely trimmed beard and get appreciation. But if you don’t have the right grooming tools to upkeep a mannish look, everything will fall apart. One of the most valuable grooming tools is a beard trimmer. You need to tame the growing beast on your face. With the suitable trimmer, you can rock any look you love. No matter if you want to go for the sophisticated gentlemen look or punkie lumberjack. 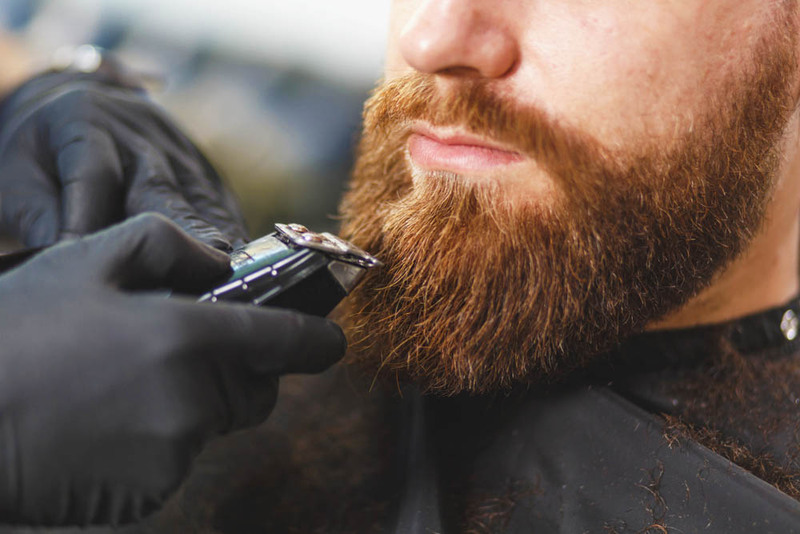 So to help you out with your regular clean up routine or just to make your ambitious beard style a hit, you need to think about picking the best trimmer suitable for you. 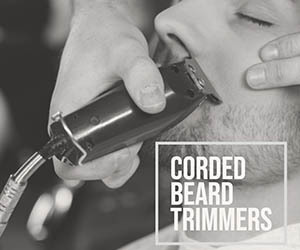 Today we’ll be talking about the Best Corded Beard Trimmers available in the market right now. These ten I included would give you everything you need from an efficient groomer. If you find it confusing to choose the right one, don’t worry. I’ll be including my best advice to help you out! Let’s jump right into the reviews! With overflowing models and brands in market, it’s going to be challenging to understand what works well and what does not. Here’s are ten of my favorite corded trimmers for beard that are well functioning, provides excellent cuts and feels safe in hand. 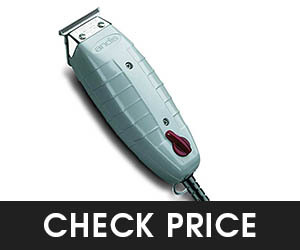 The Andis professional t-outliner is a beard trimmer that suits any dry shaving requirements. The brand itself is really popular and reliable. Andis t outliner 04710 is one of the commercial success trimmers in their lineup. It comes with pre-oiled facilities from the factory. The trimmer is tested and proven to give you the best cutting experience with smooth and safe gliding. It’s a unisex product but suitable for men regular trimming needs the most. So once you get it, your spouse will also thank you for that. The cutting blades are super sharp to give you a flawless gliding over facial hairs and trim mustaches, beards and even neck area. You can also use it to trim the edging around the ear. It’s for sure the best one in my list and the most desirable trimmer with all basic necessities. The cuts are really close and complete. This brilliantly designed shaving tool for men also come with a contoured housing. It holds the high-speed motor safely that gives you the utmost enjoyment for a convenient dry shave. It can be used regularly without any wear and tear. The blades are adjustable carbon steel material that gives you the perfect detailing while each shave. It comes with 7200 speed per minute feature that’s one of the most highlighting things about it. The perfect weight to hold and handle. The grip is super smooth and comfortable. The blade is super sharp and adjustable. Might get hot if you keep it on for a long. Wahl clipper groomsman trimmer is a professional level men’s trimmer that comes with every little thing you need for a perfect cutting experience. It comes with an excellent design and construction that’s going to stay by your side for many shaving sessions. The Wahl 9918 is one of the most popular picks from the famous brand that is a quite renowned name in shaving tool arena. It’s a rechargeable trimmer and clipper that comes with a whole grooming kit full of accessories. You can be sure to enjoy the most lavishing shaving experience. Ladies out there, get it as a gift for the men in your life. They’ll love it. This mind-blowing clipper and trimmer come with high carbon blades that are precision grounded in design. So that the sharpness stays longer and better even after a few days of usage. You would be getting six position beard regulator that’s an excellent feature for effortless shaving. There is a memory function to make things even easier for you. The handle comes with a contoured ergonomic design. There are soft pads that ensure the grip is comfortable for any shaving style. It comes with a travel pouch, power switch, and a lock mechanism. There’s a good three-year limited warranty coming your way too. Super sharp blades for precision cutting. Effortless cutting with six position regulator set up. Includes a smooth memory function. Comfortable grip for long time usage. It’s somewhat noisy while dealing with ear edge areas. Wahl professional balding clipper is the finest choice for any stylist’s needs with super features to glow up any beard fashion. This preciously designed trimmer is one of my favorite with the professional level of cutting results. 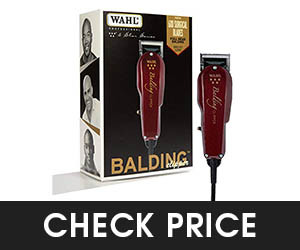 Wahl Professional 8110 comes with a surgical cutting feature. So that you can even try full head balding with it aside form effortless beard trimming. This clipper also comes with a powerful motor to give you twice speed than random models. The sharp performance needs the appreciation that even includes a bunch of accessories. It comes with a cleaning brush, red blade guard, oil and attachment combs to give you a barbershop experience at home. This is a salon-must-have trimmer that gives you convenient blades to be safe with any skin type. After shaving your skin will feel smooth and clean. The one pound weight might seem like heavy but actually, it’s quite manageable. Because with the speed you don’t even need to hold it for a long time. There is a clear instruction manual that’s going to make your experience user-friendly and easy for everyday shaving. In short, it’s a great choice to have a close surgical cut for an everyday dry shaving need that will leave the skin smooth and cut free. A barber-shop must have clipper design. It’s suitable for effortless dry shaving. Comes with a good manufacturing warranty. There is a convenient cleaning brush for post-shave. The blades are sharp and safe to use. You can’t wash it with water. 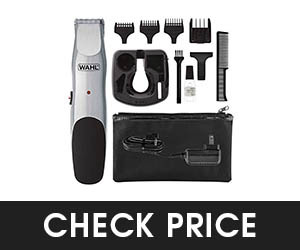 The Wahl 79602 elite pro is a men’s electric clipper that comes with a comb guide fit settings and stainless steel clip design. It’s a professional level kit that is flawless for any hair cutting requirement including the beard. Wahl 79602, from the popular brand, is a complete kit that includes styling combs, cape, blade oil, handled storage case, scissors, and many other important tools for a perfect cutting experience. The trimmer for beard and mustache is made in the US and is one of the best known for sharp clips to deal with sturdy hair. It comes with any style cutting feature that gives you the effortless use of both wet and dry shaving. The included combs will give you a barber shop experience at home. You are going to find it super smooth and easy to use with safe results. The stainless steel clips are securely fit to avoid any kind of accidental incident. There is a taper lever that adjusts according to your convenience. This makes it easy to blend and fade. It’s suitable for any length beard-cutting. The noise-free trimmer includes a durable motor with high speed to ensure the performance you get is powerful. There is also a limited lifetime warranty coming your way. A complete kit for any hair type. Suits both dryer and wet shaving. Comes with safe and fitted stainless clips. The motor is powerful and durable. It does not make any kind of noise. It has some heat up issues. The OSTER Fast Feed is a powerful trimmer or clipper that come switch whisper quite running ability. It comes with some of the most useful features that are really convenient for regular trimming needs of a busy man. It comes with an effortless design that suits any type of hair. It’s convenient for both wet and dry shaving needs. You can easily switch according to your needs. You also get steel blades that are super sharp but at the same time safe for any skin. It comes with 000 to 1 size adjustment feature to give you different cutting angles. There is an ergonomically designed housing that comes with all day cutting texture. So that you can easily hold and shave or trim according to your preference and style. The 16-ounce weight is easy to hold for a long time and manageable also. It comes with 4 guide combs to give you effortless trims. The whole package includes other essential accessories such as lubricating oil, cleaning brush, and even blade guards. Overall it’s a good choice for budget-friendly purchases. The blades are sharp and smooth to use. It comes with a very quiet but powerful motor. The trimmer suits any style cutting or trimming. There are 4 convenient guides. The weight is very compact for effortless trimming every morning. It sometimes has problems with hair snagging. The Wahl peanut 8685 is a barber style professional trimmer that comes in a very handy size to have effortless trims anywhere anytime. The whole performance is super sharp and smooth to ensure proper detailing and edging. This trimmer with its compact size is a perfect fit for men who need to have a trimming tool on the go. It comes with the minimal 4-ounce weight that’s very easy to manage and handle. You can easily store it in your bathroom shelf. It comes with a bunch of other units that will make trimming effortless. There are 4 cutting guide combs, cleaning brush, instructions, red blade guard and oil for giving you the smoothest performance. The cuts are smooth and even. You don’t have to worry about accidental trimming. You can easily use it to get smaller cuts. It’s a perfect pick for beginners since there are fewer chances of huge strokes. The speed is average and it helps you to have touch ups real quick. Also, the trimmer feels easy to hold thanks to the ergonomic design. It stays firm on hand and the weight does not make longer trimming sessions any hassle. It gives you even cuts and straight aligning line ups overall. A cute little peanut size trimmer for any time usage! The size is really convenient for travel needs. It comes with a good grip design. The trimming strokes are flawless and perfect. It comes with good sharpness. A perfect tool or professional touch-ups. The plastic latch needs improvement. 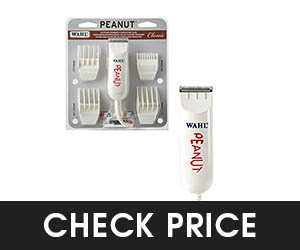 The Wahl professional peanut trimmer has two almost similar models. The 8685 is white which comes with a really smooth handle. While the 8655 comes with a black color body that looks like a peanut somehow. The 8685 looks cute with no gimmicky design on it. Also, it’s a thin designed trimmer with basic features. It does not include many curves or markings which is really convenient to hold in a small hand. On contrary, the black body is a bit curvy and sometimes feels irritating on hand. Even if 8655 is a new model to 8685, for a competition, I’ll choose the older one. However, the only difference is in design. Both are excellent for a peanuts size trimmer. 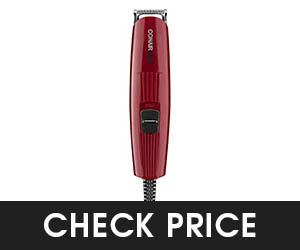 Conair beard trimmer is a smart choice as a corded tool that comes with precise cutting and trimming. The overall design is really user-friendly and easy to manage with a very lightweight design. The beard trimmer comes with every basic feature that you will need. Waking up every morning you’ll enjoy the most convenient trimming experience. It’s easy to cut and hold and give you quick trims for a busy day when you are short on time. There are three combs included with the whole package. Two of them are jawline combs that give you the pleasure of detailed trimming. Then the last one comes with five adjustment positioning cutting. It also includes stainless steel blades that are sharp enough to deal with sturdy facial hair. You can easily detach them for changing to better blade set or simply to clean them off. It’s a budget-friendly option that is perfect for men who are looking for minimal features that work constantly without falling apart after barely a few days of usage. The construction quality is sure to give you a good and long-lasting experience with the trimmer. Overall, it’s a great choice for regular trimming needs. It comes with three all-purpose combs. It’s suitable for both dry and wet shaving experience. The weight is minimal and easily manageable. Gives you a clean and comfortable shaving experience. Stray hairs are an irritating problem with this trimmer. Remington HC5855 is a fifteen pieces hair clipper set for men that comes handy for anytime beard grooming need anywhere. It’s one of the most convenient kits that comes with an effortless trimming experience, thanks to the user-friendly design. The trimmer kit includes a magnificent quality construction that makes the whole set virtually indestructible. The toolkit includes a beard brush, a styling comb, oil for the blades and a length adjusting combs for an effortless cutting experience. There is also a portable pouch also to carry them anywhere or store effortlessly. You won’t be dealing with any snagging with the power cut blade system. The blade is properly aligned to give you even and smooth cuts. You can also easily change the blades to other types, for example, T-blade and balder blade for better cutting. You can detach and clean them also for regular maintenance. The motor is super powerful super magnet type that gives you better torque. It gives you a better cutting system that is even twice high than the average model’s motor speed. So you won’t be hanging in the morning for a quick trim. This trimmer includes precision grounded blades that give you the finest cutting experience. You can easily even deal with the thickest hair. The blades are super sharp for an effortless shave. It suits any skin type. The blades are removable and easy to clean. The motor gives twice speed. It comes with an 8 ft. long cord. Sometimes the hair gets pulled. The Panasonic beard trimmer is a corded beard trimming tool that is also available with cordless feature. 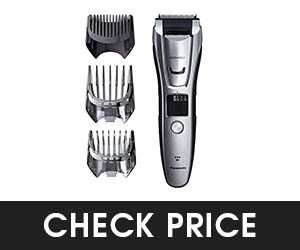 This high-quality durable trimmer comes with 3 comb attachment and adjustable trimming settings that makes it one of the finest deal to crack. It comes with a 45-degree blade that is durable and sharp enough to even cut through the thickest facial hair. The stainless steel blades are hypoallergenic type. Which is useful if you are dealing with acne or other skin issues. The blades will give you a safe trimming. It not only deals with the beard but other body part hairs as well. You can use the versatile dial available on the trimmer. There is a total of 39 effective precision settings available. Also that no matter what you need to do starting from sculpting from detailing, you can easily do it with ease. The three comb attachments are quick and flawless to use. It comes with a slide up design that makes it super user-friendly and manageable. You are ought to have the perfect trimming and even detail your beard to try lots of challenging looks. This feature makes sideburns a piece of cake as well. You barely need one hour to charge it up completely. 39 settings for flawless trimming and other cutting experience. A perfect tool for personalized styles. Durable and safe blades with 45-degree adjustments. The grip is rubberized and comfortable to hold. The small portion below the blades cannot turn on or off itself. 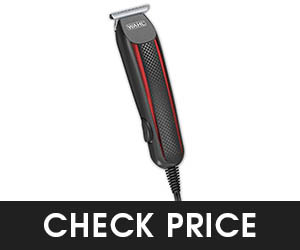 The Wahl T styler pro is a budget-friendly trimmer that comes last in my list. But even if I placed it last that does not mean it is worthless. Some of you will love the effortless and simple design it has for a minimal shaving look. Wahl 9686 is meant for dry shaving. However, most trimmers have the habit to leave bumps after a session. This irritating problem is never faced with 9686. It comes with precision ground T blade that gives you the closes clean shave for a spotless look. You won’t be dealing with miss aligned and curvy line anymore with this trimmer. It gives you the crisp clear line whenever you deal with sharp edges. Thanks to the Edge pro corded facility it gives. The whole weight is easily manageable with a soft grip that’s quite comfortable. Line definition is marvelous. Zero overlap blades will always help you to get a nice ash line whenever you try to edge. Moreover, the trimmer comes with a powerful motor too. The corded unit gives you enough torque energy to get a good speed and quick trimming experience whenever you are in a hurry. The blades are precision type to give a clean and close shave. It comes with excellent lining up. The motor is very powerful for quick trimming. It’s a compact trimmer to easily hold and use. It comes with twelve blade guides for even length maintain. Some factors play a really important part for your purchasing journey. There are a bunch of mustache trimmers available in the market. I’ve cut down the list and included the best ten earlier. But yet, you just can’t buy anything from the list just because they are the finest choice for me. Know proper about mustache trimmer. That’s why I’m adding this section. Be sure to know about these factors before you make a final choice. This way what you buy will not disappoint you later. Let’s know the few most important ones below. Probably the most important consideration is going to be about the blades. A trimmer with no good blade is nothing but trash. You should continue looking into other features only when the blade sounds good quality. To me, the most preferred material is stainless steel. They are really good quality and avoids rust problems. Even if there are some brands who fail to provide good blades. They are just named stainless steel blades but work nothing like them. Also, the stainless steel blades are quite sharp. Not dangerous I mean. They are good with the little force and shaves even the smallest hair on your face. So be sure to read properly about the blades. Also, look for something that assures hypoallergenic facilities. There are so many men who suffer from sensitive skin problems or allergen issues. To them, this one thing should matter the most. A safe hypoallergenic blade material. Moral: A blade that’s sharp, rust free and hypo-allergic will do the best! A trimmer that is versatile will make things easier for you. If possible, try to look for a trimmer that can give you more than just trimming the beard. A multi-functional trimmer will save your money as well as your time. It will also save space in your bathroom area since you don’t have to get all the separate tools for beard grooming. You can trim mustache, eyebrow hair, beard, and other body hair parts easily with a flexible trimmer. Get something that can do multiple things for you. Moral: A versatile trimmer will save money, effort, time and space! With so many models out there it’s obvious that we are going to meet a number of designs. You should be able to get something that goes well with your grooming style. However, be sure to get something that’s not too complicating. A simple design with user-friendliness is what you actually need for regular day usages. Try to keep things good by picking a trimmer that comes with smooth handling. Check the grip, if it’s comfortable enough for you to hold and trim. You need to handle the mustache and beard area without any discomfort. So a better idea would be to go for trimmers that come with a rubberized handle. Most of the time, they give firm and easy hold. Moral: Smooth to handle and firm to hold, a trimmer should be easy to use! You need to be concerned about the trimmer’s construction quality. You just can’t depend on a cheap looking trimmer that comes with weak and volatile materials. It’s going to waste your money and mood. Sometimes there may be cuts on your face with these. So basically, you get an ugly mark on the face instead of the lavishing mannish look. Don’t buy something that will ruin the purpose. Instead, go with trimmers that come with a good quality built-in. Check for the construction material and ratings. Be sure that the manufacturer is clear about the materials used. You need to have an idea about the customer’s view as well. 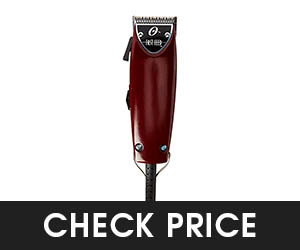 A trimmer that gives you long-lasting servicing is the best pick for any man’s need. One good way to pick a durable beard trimmer is to look for a high-tier trimmer. Something that’s not too expensive but also not too cheap. Go for the midway and you’ll receive a decent quality hopefully. Moral: A durable and well built-in trimmer serves for the long haul. There are some trimmers that work for dry shaving and others are meant for the wet style. Choose something that goes well with your morning routine. 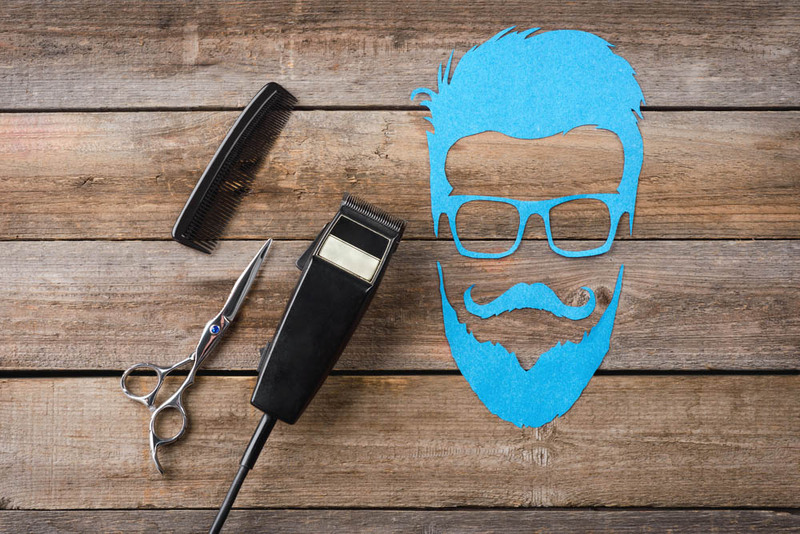 You need to pick the trimmer that suits best your style. You can go for grooming trimmers that use both modes. You’ll simply switch it to any mode and enjoy wet or dry shaving effortlessly. However, they might price a bit more than the one styled one. 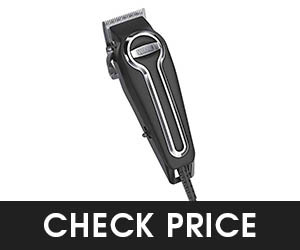 To go well with your unpredictability, choosing the multi-style trimmer will do the best. Moral: Switch the mode and enjoy both wet & dry trimming! What about the Length Settings? You may want to try different lengths for your beard style. It’s obvious you won’t be cutting in one shape if you are a beardoholic. However, if you get yourself a conventional corded trimmer that does not allow for any length settings then you may get into some troubles. So go for the models that include length settings within. That way you’ll always have the choice to go for a luxurious long beard or the stubble short style easily whenever you want to. There are so many options for a good beard corded trimmer that gives you a switch up beard style facility within. Moral: A trimmer with length option will cater your preference better. Are Extra Features Worth It? Maybe or maybe not. It depends on how you look at your preferred beard trimmer. So many men would want to go for a trimmer that comes with an extra bunch of features. It’s good in some way since you’ll be having some assistance for other trimmings. But what you need to think is that sometimes the additional are not worth the price. You should be focusing on what you need basically. Your essentials should come first when you choose to buy a particular trimmer. If the basics are right then chances are that most other parts will fall into places automatically. However, you still can go for versatile models that give you additional features. Such as nose trimmers, pop-up ear trimmers, vacuum system, and turbo trimming modes. There are so many of it. These will help you to maintain your looks better. Moral: First & foremost is basics then comes extra features! Today we have so many reasonable beard trimmer models. Also we have some good sets of scissors for trimming. So basically it’s going to be quite difficult to declare one as the best tool to trim beards. They do the same thing but in a different way. It’s you, who need to decide which one goes with your lifestyle and habits. A good beard trimmer can give you so many benefits to love. You will never feel a shortage of choices. They are available in various designs, functioning and sides. 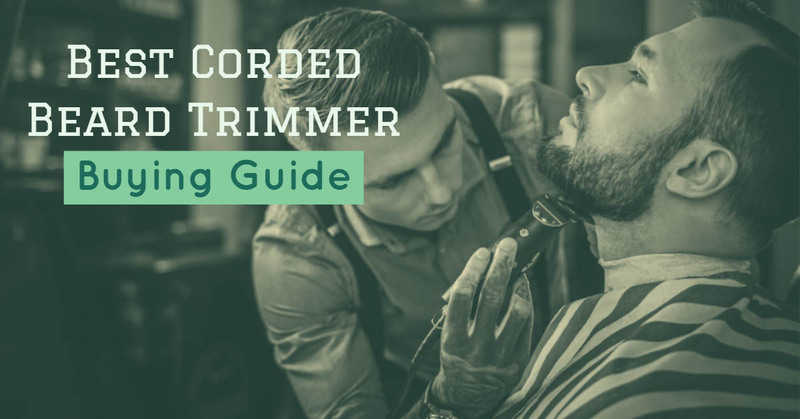 The corded trimmer for beard will give you fast trimming experience. They are easy and there’s absolutely no fear of cutting. You barely need to be super smart to avoid accidental cut or mess the shape. Also, they are time-saving. Today we live in the technology era, most men prefer an easy solution to every problem. Trimmer is the easiest one. You can decide any length, go for intense looks and have multiple features at one time. These are appropriate for cheek, neck and even back lines. Obviously, like most other things in life, trimmers are also not fully perfect. They have a few bad shades as well. If you hold this on a wrong angle, chances are you might get a lot of hair cut mistakenly. You need to be expert enough to enjoy the speed of trimming with a trimmer. Beard trimmers are like a workhorse. While scissors are meant to give accuracy and precision. You get a refined and profound look with scissors. Only because you get to spend more time cutting. These are flawless to get rid of those extra-long hairs that you miss while having a trim. Also, they give you a good trim overall if you have the will to spend time for it. Chances of bigger mistakes are less here. But then again, it’s a very long process. If you are a busy man with a hectic life, this will take away the will to groom regularly. You get a detailed look with added time. You should be able to say what you are comfortable with more than anyone else. If you are having trims every weekend, you can spend a good amount of time then use the scissors for a better and profound look. However, if you are just like most of us, a very busy regular working man, then you need quick grooming solutions. That moment, only a trimmer can save your life! The best way would be to use both of them. You can use the scissors after trimming with a trimmer. This way there will be less chance of any overlooked long hair. How to Use a Corded Beard Trimmer for Different Looks! You have multiple looks to try when you want to get a perfect beard trim. The beginning should be from deciding the beard length. What length do you ideally prefer? Decide first that. If you are someone with classic look beard or a full style that fades away with your face, then choose 3 guard settings powerful trimmer. A sensual 5 o clock shadow, a cropped look will need you a simple stubble trimmer. Get some oil, to begin with. You should oil the blades properly before trimming. This will help them to run better. There should not be any excess hair so go with a clean-up also. Once the saturation of oil is done, wipe it off and it’s ready to work. To start with trimming go for long and fine short. You should depend on your final length goal. This way there would be less irritation on the skin. Sensitive skin friends, please pay attention to the last line. Working your way down is a good idea to start with a higher guard. You would be able to trim again the length is not satisfying. However, once it’s short you can’t go back. So it’s better this way. You need to trim over the whole beard. Be sure to go upward and against the grain. The flat part of the comb should lay against your face. That way you’ll have better results. Don’t ignore your neckline. Now you can switch to lower guard if you want to. Repeat the process. Do so until the beard length is your preferred one. Once you are satisfied with the looks, clean up stray hairs. It’s important to have the perfect finishing touch. You need to focus on Adam’s apple also. Trimming mustache has minimal goals. It’s good to trim enough so that your lips are clear. It should not go much higher though. You should go for good accuracy and sharp blades if you can’t find profoundness with supplied blades along with your trimmer. Another solution is to go for a narrow blade. Now you need to get a mustache comb. Use the teeth of the comb and lift a small portion of hair within it. Now simply trim and work at ends per side. Keep on doing the same thing with other direction. Once you are done get a check on the mirror. Be sure that both ends look the same and even. They are going to look nice and groomed now. However, you need to work for some finishing touch yet. Use the trimmer again and shave tip and sides of your mustache. You should cut a small amount at one time. So that there’s no mistake. You should decide the mustache angle during this step. Once you are done, use the comb and brush through your mustache properly. You would be able to pick any long hair if you missed any. So there will be less chance to overlook even a single mistake. Use your favorite styling product and groom it up. You are all ready to show off the classy mustache to the world. Let your beard grow for a while and once it comes to the desired length, add the goatee flare to it. It’s a good idea to make the goatee bigger than you want to. This way you’ll be safe and later cut it down for the desired length. You should shave the edges to get your preferred size and shape. You can use a beard comb and use it for straightening any curly hair. This way you’ll find it easy to trim and end results will look more realistic. Start form sharp and clean corners at your jawlines. Now you need to get the right width. A good guideline is the width of your mouth. Remember that when you smile your dimples should fall in a good place in the edges of your goatee to land. You should be sure both sides are symmetrical. Stop every couple of minutes while trimming to make sure you are going right. You need to ensure that it looks even. Always trim it regularly to maintain a trademark clean edge goatee look. You should clean the edges every day to get a look that deserves flood of compliments. How to oil WAHL beard trimmer? If you own or thinking about owning a Wahl trimmer then, first of all, I appreciate your choice. It’s definitely a good pick. However, there are some rules you need to maintain to make it work properly. You should oil them regularly to use them well. It’s super simple and needs barely a few moments. Later you’ll be enjoying the smoothest cutting experience with longer blade life. First of all clean your blades properly. Simply hold the unplugged clipper facing downside. Wipe off any excess hair with a brush or cleaning tool. Now they are ready to oil. You should oil every unit to ensure better performance. Make sure you are holding the unit in such a way that the blades face downwards. Switch the blades and while they run dispense few drops of oil on the top blade. You must use Wahl clipper oil. Since other oils might gum up the blades. Now wipe any extra oil so that it does not jam the motor. That’s it you are done oiling! Cleaning any beard trimmer is super easy. It is going to take only a few minutes to clean. First, begin with rinsing the blades ion running water. You should get rid of any excess hair that is sticking out. Now you need to deal with the hairs that are inside the trimmer. Do these with running water. You need to shake the trimmer four to five times gently. Then wipe the water from the trimmer and clean the blades also. Now you should simply place it on a towel or clean fabric. Gently press with fabric and it will get dry. That’s it, your trimmer is now clean! How to sharpen electric beard trimmer? You can sharpen your blades yourself easily at home. First, remove the blades from it. Now you need to have a good 400 grit coarse honing stone. Run along this stone your blades well. You’ll find these stone at any home improvements or hardware shop. Now you need to angle the blade. Just move it ahead of the stone for continuous ten times. It should be shiny and even with every turn. You can now repeat the same with other edges. It’s time to sum up! You need to remember that the trimmer you choose will create an impact on the most attractive part of your personality. Your Face! It’s going to give the whole presentation of your aura. So before you just shop carelessly any model for a trimmer, wait and think about it more! You need to do some basic homework and good research. It’s going to take some time but that way you’ll be saving your money and time for later. Just focus on your exact requirements. A battery operated trimmer is an efficient mechanism to make trimming a piece of cake. Don’t make the wrong choice and ruin the purpose. I would vote for any of these ten best corded beard trimmers. All are really well functioning and I’m already head over heels for their features. But I prefer a particular model because it deserves more attention and courtesy. It’s the Andis Professional T-Outliner Beard Trimmer. 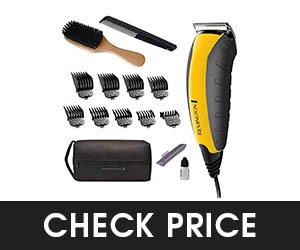 This model gives you the utmost trimming features that come with very practical pricing. However, you might feel the same for another model. If you do so, don’t neglect your instincts. You can say better what will work for you. Just make sure to give your needs proper priority. I promise you’ll get better results that way! Have a great time enjoying a lavishing shave!